Many times I've made Pizza with yeast in microwave oven. 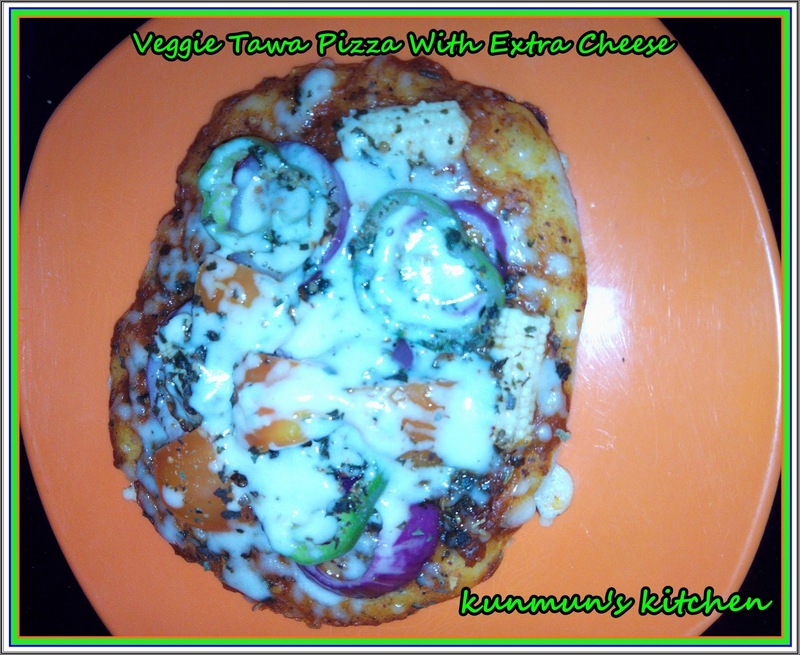 But this is my first trial about Yeast free Tawa Pizza n the result out come is awesome..about in taste, crisp n crunchiness. Prepared for this my niece n she loved it..Plz try it for your kids and share with me your valuable views. 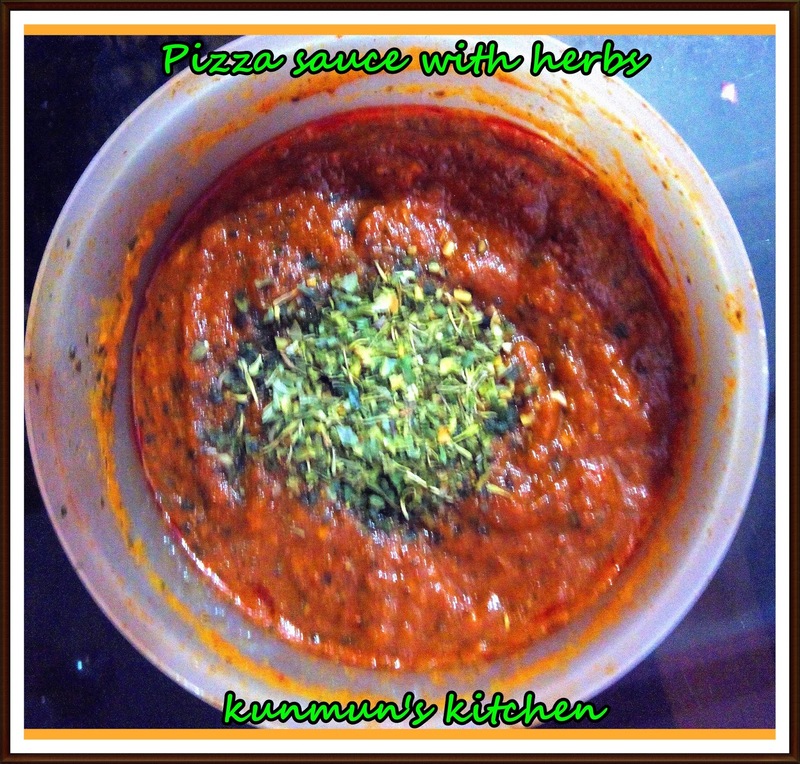 Method :- Take all the ingredients together in a wide bowl and mix together one by one and make a soft dough. Add little olive oil on its surface and cover it. Keep it in a warm place for max. 1 or 2 hours for fermentation. If you could keep it more time, the result will be more better. But you can use it after 1 hour, if you are in a hurry or make it quickly. Tomato blanched - 6-8 nos. Method :- Heat water in a big pan. Cut a lightly cross mark by knife on each tomatoes and put it on the boiling water. After 2-3 mins, remove it from water and directly put it in cold ice water. So that, easily you can remove the outer layer of the tomatoes. Chopped finely and make a very fine paste. Heat oil in a non stick pan. Add the bay leaf, chopped garlic, dried herbs 1tsp and saute awhile. Add the tomato paste to it and let it boil in medium flame. Continuously stir it, till it became sticky and having no moisture. Add the red chilly powder, pepper powder, tomato ketchup, sugar, salt to taste and finally the herbs. Cook for more 5 mins and add little butter,basil finally and switch off the flame. You can store it in refrigerator for a couple of weeks also. Divide the dough into equal balls. Sprinkle little dust of flour and roll out the dough with the help of a rolling pin into your desired shape. Prick the base with a fork, spread pizza sauce on it. put the toppings as your choice (Onion, Capsicum, Tomato, Baby corn, Olives, Paneer cubes, Mushroom as your choice). Sprinkle pepper powder, little salt to taste. Spread mozzarella grated cheese on it. Any one can also use Cottage cheese or Processed Cheese.